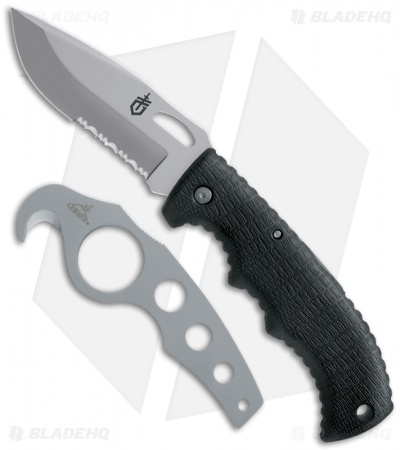 The Gator II folder is an excellent hunting knife that comes with a ballistic nylon sheath and gut hook; everything you'll need out in the back-country. The Gator-Grip is Gerber's famous thermoplastic technology that is slip resistant and ideal in even the most extreme environments. The stainless steel blade opens effortlessly with the thumb hole. The accompanying sheath is constructed of thermoformed ballistic nylon, and accommodates the included gut hook.